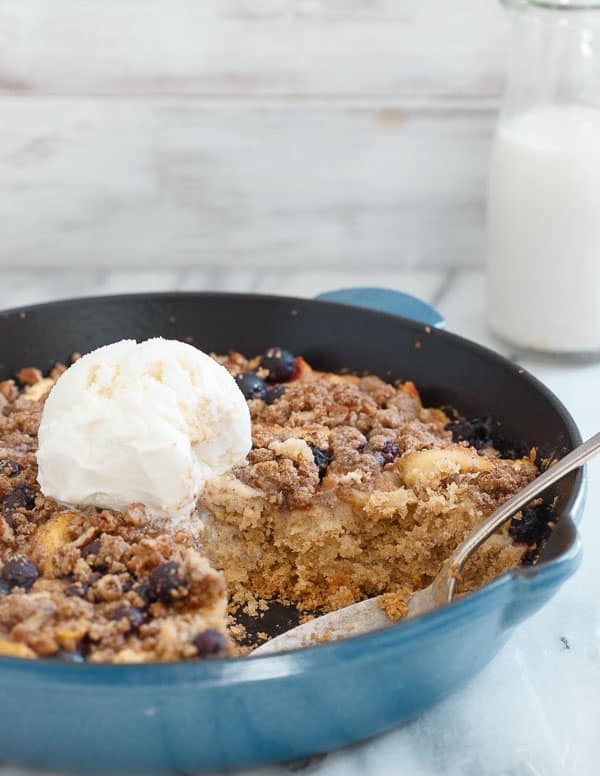 This gluten free peach blueberry buckle is a combination of a cake and a fruit crisp. It’s filled with fresh summer berries and just begs for a scoop of vanilla ice cream on top! Have you heard of a buckle before? I feel like I knew it was out there but really had no idea what it was until recently. See, 7 pounds of farm fresh picked peaches will make you research such things. A crisp seemed too predictable, I just did a galette, a crostata is basically the Italian version of a galette, cobbler was way too unoriginal, especially with peaches so a buckle sounded cool. The thing is, I kinda hate the name. Buckle. Like what IS that? I just keep thinking of a seat belt in a car which brings me to my current life dilemma: I want a new car but I’m being super cheap. Here’s the thing, I’ve never in my life had a car payment. With a dad who sells cars and a husband who used to own a used car dealership and always had access to wholesale auctions, I’ve owned about 10 cars in the 17 years I’ve been driving that have all been 3-6 years old when I’ve gotten them. I’ve paid wholesale prices in full so I don’t tend to lose much money, if any at all, when I sell them 2-3 years down the line. The problem with this situation is over the years, my taste has gotten more and more expensive and pickier with each car to the point where what I want now is at least $20,000 used and the practical side of me just can’t justify that. Then there’s this weird daredevil voice in my head that says, “if you’re gonna spend $20K, you might as well spend $40K and buy the damn thing new, you deserve it!” Until I remember how amazing it is to not have any payments in my life outside of our mortgage. This cycle has been playing on repeat in my head for the last 4 months straight as I jealously look at what seems to be everyone around me getting new cars. I’ll go crazy for a week scouring the wholesale auction site, eBay and Autotrader trying to find the steal of a lifetime for what I want, then say “screw it, I’m over it” (and usually slam the computer shut for effect) which will last about 2 weeks at best before it all begins again. So, thank you, dear peach blueberry buckle, for starting the cycle all over again this week. 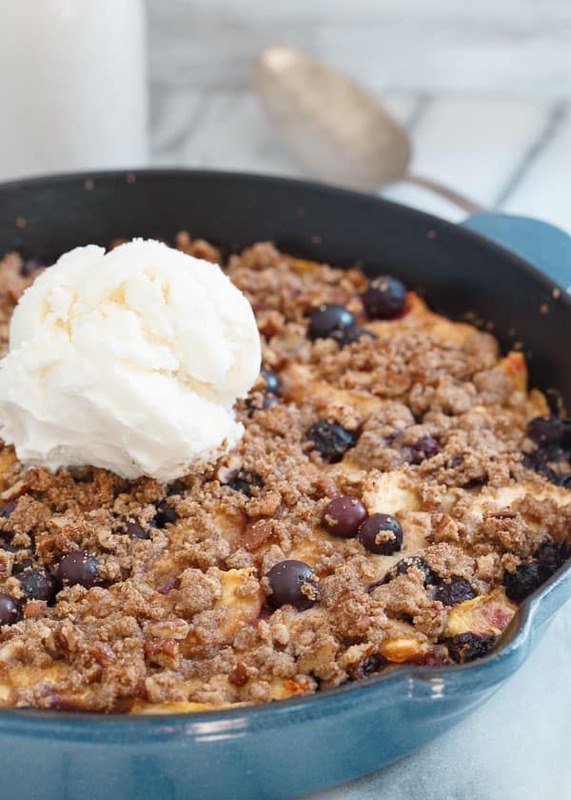 Thankfully, you don’t come with a payment, just a skillet-ful of moist cakey goodness layered with fresh peaches and blueberries and a sweet buttery streusel topping. You’re gluten free (yay!) but you don’t have Bluetooth and all I really want in life right now is to be able to relive my teenage gangsta days with the 90s hip hop station on Pandora wirelessly from my phone when driving to CrossFit (…in my 2010 or newer Lexus rx 350 for under $20K). 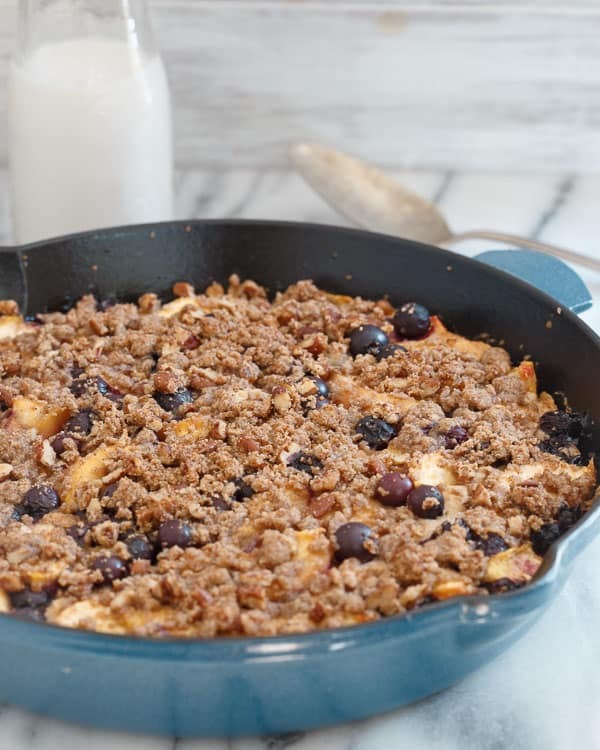 This gluten free peach blueberry buckle is a combination of a cake and a fruit crisp. It's filled with fresh summer berries and just begs for a scoop of vanilla ice cream on top! Preheat oven to 350 degrees and grease a 10 inch skillet or baking dish with butter. Whisk the butter and sugar until smooth in a medium bowl. Add the egg and vanilla and whisk again. Add the milk and whisk once more until smooth. Set aside. Combine the flour, baking powder and spices in a separate bowl. Add the flour mixture to the wet ingredients slowly whisking together to incorporate as you go. Spread the batter onto the bottom of the skillet in an even layer. Combine the peaches, blueberries and lemon juice in a small bowl. Toss together then pile on top of the cake batter in the skillet. 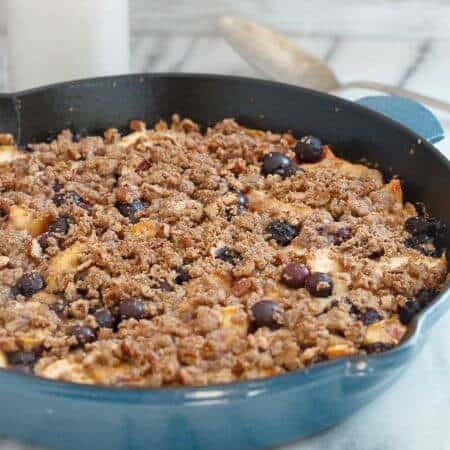 Make the streusel by combining all the ingredients in a small bowl and working the mixture with your fingers or a fork until crumbly. Sprinkle the streusel on top of the fruit. Bake for about 40 minutes until cake layer is cooked through. Remove from oven, let cool for 10 minutes before slicing. That streusel topping looks fabulous! Not having to make any car payments is a wonderful feeling – but, I am thinking this buckle is capable of producing even more wonderful feelings than that! And it’s GF!!!! This looks scrumptious! Love this fruit combination …so good! What a perfect summer time dessert! Haha I’ve always wondered about the name too! Like, Buckle Up this is the BEST DESSERT! :) Love this combo! I totally agree on the name Buckle! TOTALLY do not understand it! BUT, I do understand that I need to shove this into my face all day long. Hello delish! Pinned! Ummm I wish I didn’t have a car payment. I’ve actually been thinking about getting rid of my car now that I live in Chicago. I drive it once every two weeks and sometimes I let it sit for a month. Anyway, I love all your GF and grain free goodies. This looks incredible. Perfect chip for a lazing date in the summer. Gotta try this buckle this weekend.